Same Day Free standard shipping, including staples! MBM Bookletmaker JR, semi-automatic. 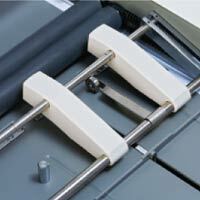 Easy to set up and operate entry level booklet maker with space-saving, compact design. Staples up to 10 sheets 20 lb copy paper to make 40-page booklets. Heavy duty steel construction. Uses 210/6EBS (1/4") staples. Complete with 2 boxes of staples (10,000 staples). Paper Size 8-1/2" x 11" to 11" x 17"
Dimensions (D x W x H) 16-1/2" x 19-3/4" x 9-1/4"